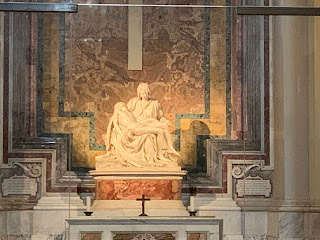 The beginning of April and these last four days in Rome began, fittingly enough, by visiting two of the four major basilicas in Rome. After a 20-minute car ride, we arrived at St. Mary Major Basilica which, I have to admit, for several reasons, is probably my favorite of all the basilicas. Besides the fact that it is dedicated to our Blessed Mother, St. Mary Major feels more like “my spiritual home”. 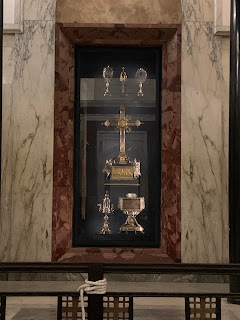 It is beautiful and simple at the same time; it contains part of the Manger where Jesus was laid following His Birth in Bethlehem, and it is normally the church where I find a good Confessor (in English) so I can celebrate the Sacrament of Penance while in Rome. 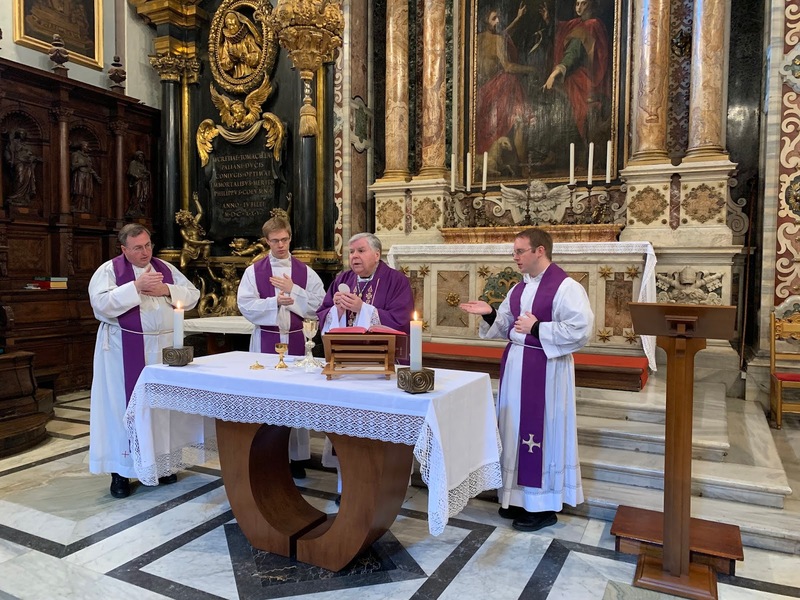 At this visit, most of our small pilgrimage group availed ourselves of this beautiful Sacrament as another wonderful spiritual preparation as we draw ever closer to Holy Week and Easter. 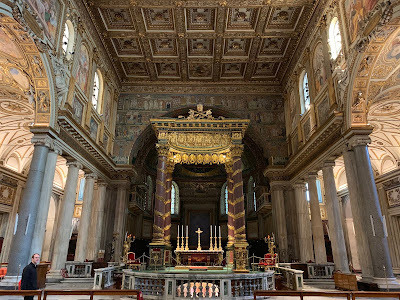 After our prayerful visit there, we then went by car to the Basilica of St. John Lateran where we would be celebrating Mass for this Monday of the 4th Week of Lent. St. John Lateran is the Cathedral Church for the Diocese of Rome, and therefore it is where the Holy Father, as the Bishop of Rome, has his Cathedra and celebrates all the official Masses and other major liturgical events for the priests and people of the Diocese of Rome. But the Lateran is also the first Church in all Christendom, given and built by the Emperor Constantine in the 4th century at the time when he issued the Edict of Toleration, giving Christians the right to practice their faith without persecution, a faith that Constantine himself embraced on his deathbed, thanks to the influence of his mother, St. Helen. 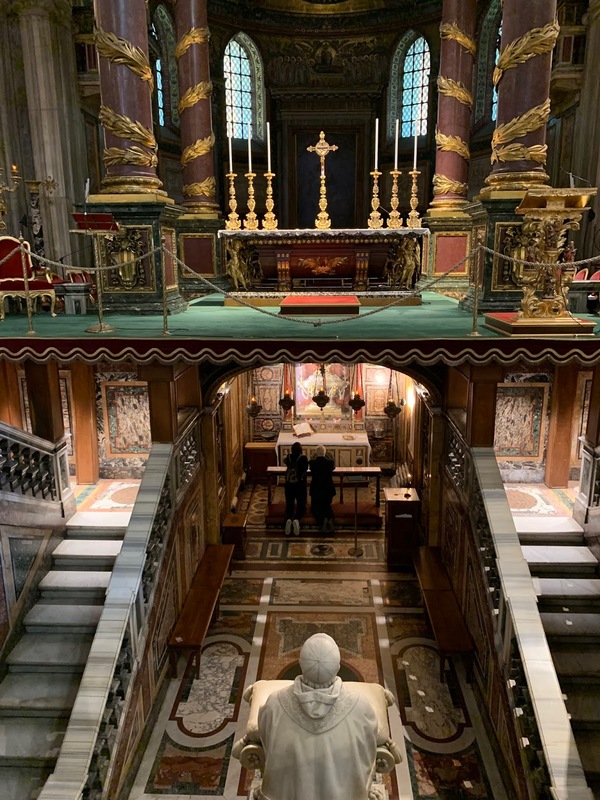 It was also due to St. Helen’s influence that we have so many treasured religious articles which she found in the Holy Land and had brought back to Rome, including the True Cross, the Holy Stairs, and the table top where Jesus celebrated the Last Supper with His Apostles. It was a joyful privilege to celebrate Mass together in one of the amazing chapels in this magnificent Basilica, and we were all greatly inspired by Msgr. Osborn’s fine homily. 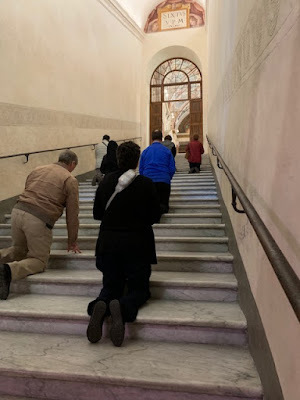 Speaking of the Holy Stairs, we went directly to where they are, just across the street from the Lateran. These Holy Stairs are the exact ones where Pilate condemned Jesus to death, and the long-standing spiritual practice is that Pilgrims who are able to prayerfully mount these steps on their knees as we meditate on the beginning of Jesus’ Passion and Way of the Cross are able to receive a Plenary Indulgence. It was truly a very moving and memorable time for us all. 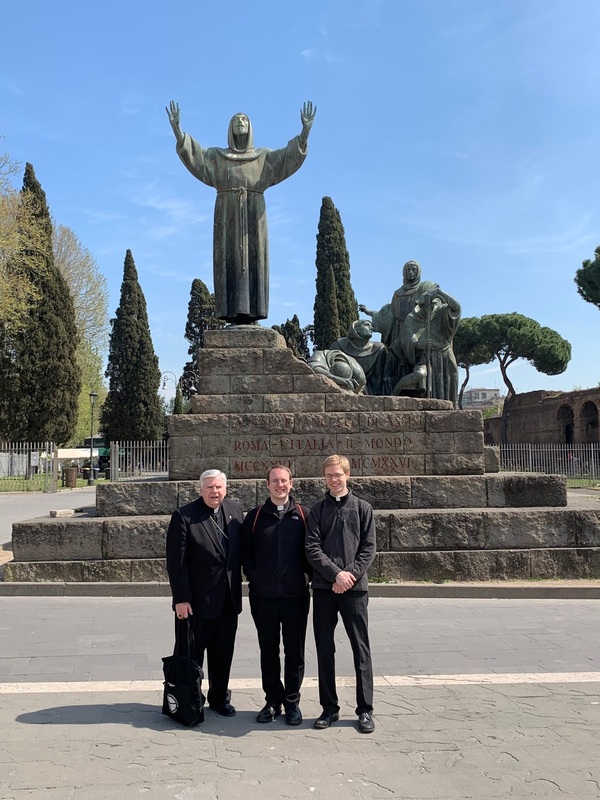 At this point, our Pilgrimage group separated, with the members of my family going off on their own to see a number of the great sights in Rome, including the Coliseum, while Msgr. Osborn, Fr. Jeff, Fr. Max and I spent the remainder of the day together to give us a chance to talk more specifically about their License Degree, the major papers (Tesina di Licenza) they have both written (Fr. 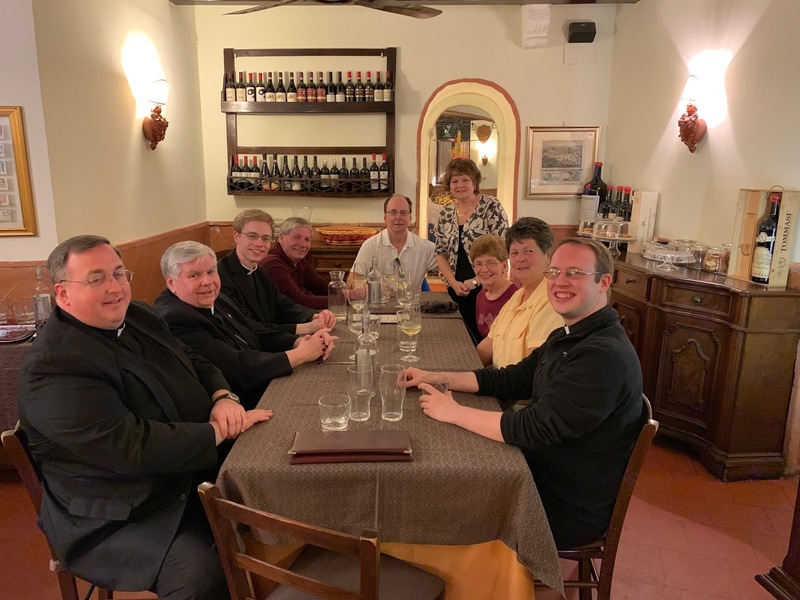 Jeff’s: “Canon 285, Juridical Categories for the Conduct of Clerics” and Fr. 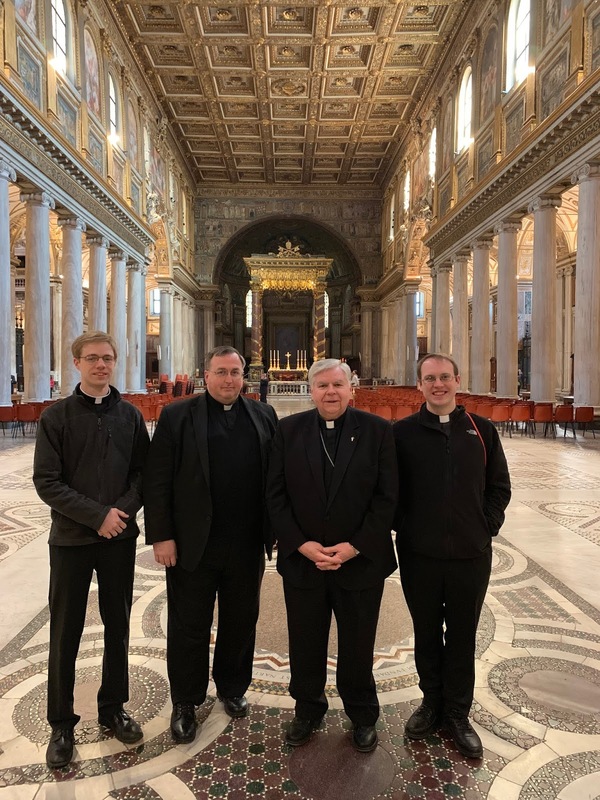 Max’s: “The Use Of Judicial Presumptions as a Form of Proof”), and our plans for their return to the Diocese later this Spring. As we made our way back to the Casa, we first visited the beautiful Church of Santa Croce of Jerusalem where many beautiful Relics of Jesus’ Passion and Death are. This was another great way to help prepare us for these final three weeks of Lent, including Holy Week that is quickly approaching. After our several hours of meetings together, and a meeting with the Superior of the Casa for his evaluations of our two student priests, we all joined together at the end of the day for a delicious light dinner to bring Monday to a fitting close. 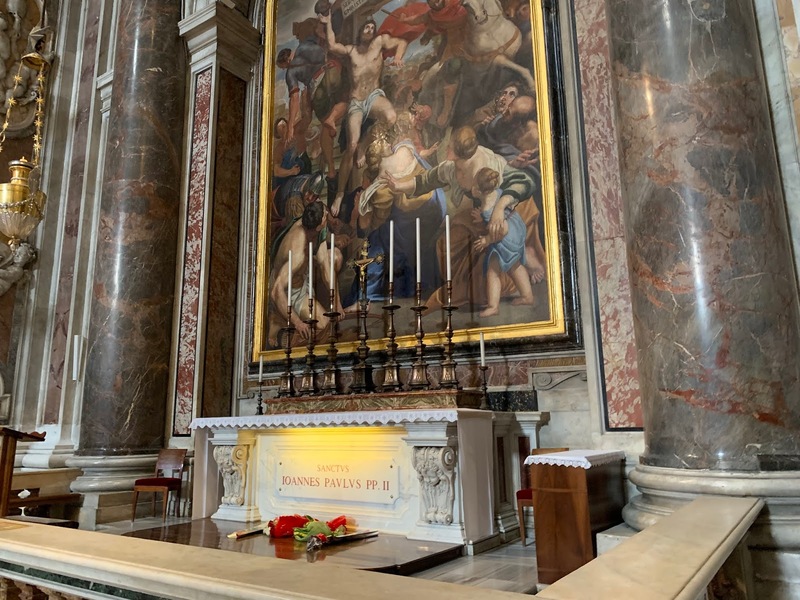 Today has been a day completely focused on the most important of all the Basilicas, St. Peter. We took an early bus to arrive at St. Peter’s so we could be ready to celebrate Mass together scheduled for 7:15 a.m. 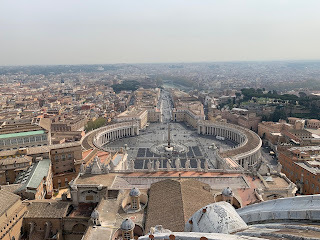 Seeing this world-famous Basilica for the first time ever, or seeing it for the first time again, is breath-taking, it’s that impressive and beautiful. 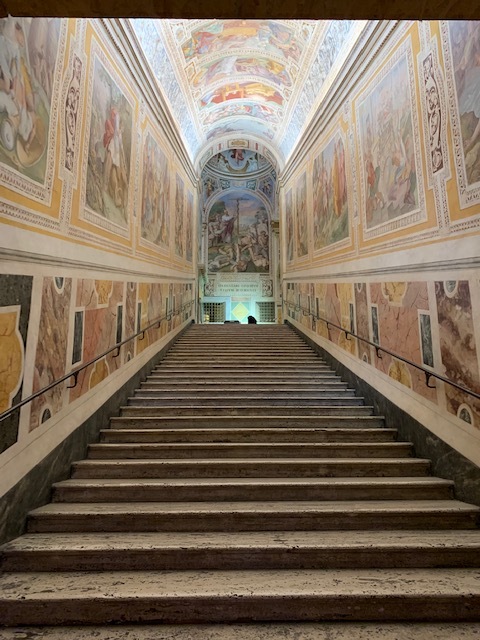 Security around all the Basilicas in Rome, and in particular St. Peter’s Basilica, is noticeably much tighter than the last time I was here, and much more restrictive. Getting through Security took much longer this time, and no vehicles are permitted down the Conciliazione (the main thoroughfare) nor around the surrounding streets. It makes it much nicer for the pilgrims who can walk without worrying about getting injured and it certainly makes the atmosphere more prayerful. While the traffic is changed, the huge numbers of pilgrims are as large and diverse as ever. At our Mass this morning in the Crypt of St. Peter’s at the Chapel of the Saints of Europe, Fr. 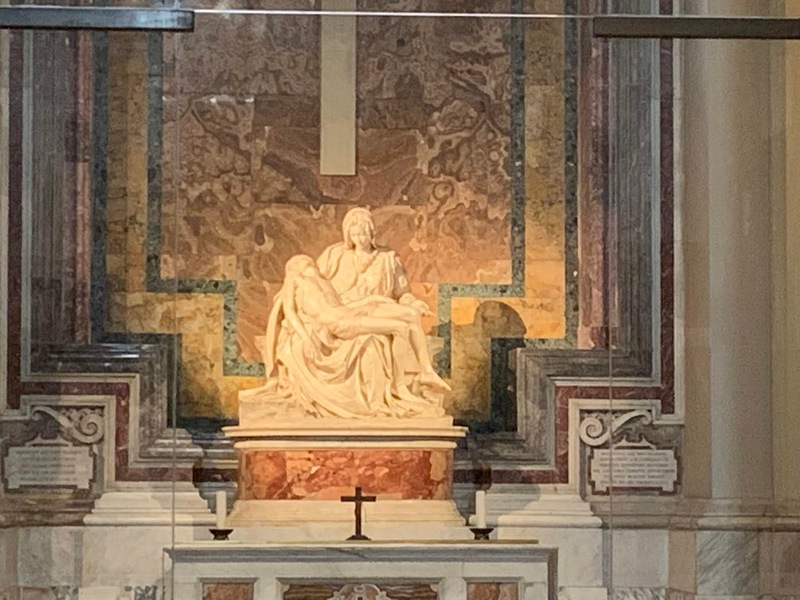 Jeff gave a very nice homily in which he included many historical facts along with his spiritual insights to help us all to have a deeper appreciation for the significance of this major basilica. After Mass, Msgr. Osborn then led a wonderful and instructive tour of the upper Basilica, after which a number of our company had the courage to go up to the very top of the Basilica to what’s called the Cupola where the view is spectacular. I have to take their word for it since I was not among the courageous ones who went, but I do have a photo to show how beautiful it is. The remainder of the day consisted of some souvenirs shopping, other sightseeing, and, following praying Evening Prayer together, a nice dinner at a German/Italian restaurant, before retiring for the evening, with our hearts anticipating the “main event” for tomorrow—-the weekly General Audience with our Holy Father, the Vicar of Christ, the 266th Successor to Peter. I look forward to sharing more about the Audience and more in the next Installment. + Bishop Paul J. Bradley. I'm totally jealous! Glad to hear the trip went so well. God bless you on your travels. Excellent! I enjoyed your descriptions very much. I wish one day that I would have a similar experience. Keep up the good work and God bless you.